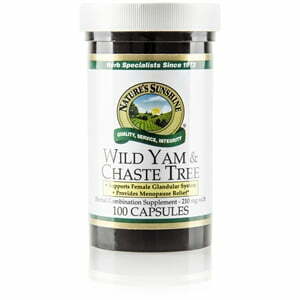 Nature’s Sunshine combines two reproductive supporting herbs in its Wild Yam & Chaste Tree Combination. Wild yam, of Chinese herbology fame and traditionally known as colic root or rheumatism root in the United States, provides important nutrients for glandular health. Chaste tree, used in ancient Greece to encourage the fertility of crops, also provides key reproductive support and helps alleviate menopause symptoms. Instructions: Take one or two capsules with a meal twice daily. Drink one glass (8 ounces) of water with the capsules. Magnesium stearate (vegetable), stearic acid (vegetable), gelatin, and water.